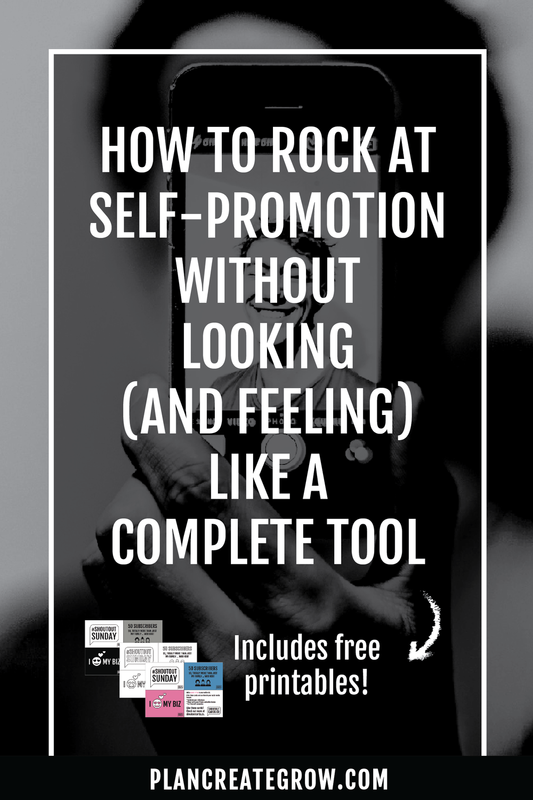 When creating an online business, we know it will come with a certain amount of self-promotion in order to get our stuff out there in the world. This includes social media, networking and generally talking about ourselves, what we do and why people should be interested in what we have to say. This is not always comfortable and sometimes it can feel downright painful. Wanting to share our art and stories with the world is already vulnerable-making enough, and now we need to get out there, cap in hand, and spruik our value to the world? Ouch. Not only this, but there is so much noise out there and so many people who seem to not only feel ok about self-promotion, but it’s kind of the thing they do best! If you’re like me and find all this a bit icky, then you probably end up doing other work instead and get stuck in the sweet spot of feeling like you’re so busy and productive and moving your business forward – and you are – but how will anyone ever find you if you don’t put yourself out there? I knew I needed to find some ways to do it differently if I ever wanted to get out and about, and get myself noticed, and to be honest, this is an ongoing thing for me and I’m not always the best at it. I think of myself an outgoing introvert so while I enjoy talking to people and can be pretty gregarious, damn do I need a lot of alone time to recharge the old batteries! This also means that it’s not in my nature to seek out new relationships and I get really uncomfortable when I feel like I am asking for favours or blowing my own trumpet. I wanted to find a way to put my ideas out there that didn’t feel hideously out of my comfort zone, and as a total bonus, I wanted this to be fun! I also knew that I wasn’t the only one who was probably looking for the same thing. So, I created Shout Out Cards. What are shout out cards? Shout Out Cards are playful, printable social media and community building tools, designed for bloggers and online entrepreneurs to help them get their content and brand out there. They’ve been designed so that you can use them as props in your social media posts, in any way you’d like. They are great as a stand-alone item, perhaps posed alongside some other fun objects, or as part of a selfie of your lovely self. You’re really only limited by your imagination. For more ideas and to get your hands on the freebie set, check out shoutoutcards.co/freebie. There are heaps of ways these can be used. Shout Out Cards are a great way of celebrating your own milestones (again without looking or feeling like a tool, because the cards say it for you! ), Celebration is a key way of keeping momentum going when you’re working towards a bigger goal as it gives you a bit of a boost and shows you that you’re on the right track. You can also use these cards to shout out the achievements of your online buddies, and help grow and reinforce genuine relationships with your peers. I think the cards lend themselves super well to Instagram, but any posts where you’re sharing photos would be great. As I've touched one, they've been designed to serve a few different purposes such as helping you mark and celebrate milestones in your business journey, to help you get noticed by others online, including influencers as well as just to add a splash of fun to your social media posts. These are supposed to be playful so as well as some fun and colourful designs, plus black and white versions, for each card I’ve also created colouring-in versions so you can make them look more on brand, and get all the fun and chill-out benefits of some mindful colouring. I want to get you started right away so I’ve put them together in one download, and you can grab these now by clicking the button below. I’m really excited to share these with you, and would love, love, love to see hear how you’re using them! Be sure to use the #shoutoutcards when you’re posting so I can look in on you and help you celebrate your business. Not only will I get to check out your milestones, but by using this hashtag others in our community will be able to too! I think it’s going to be a fun experiment to see how people use these. I’ve got a few ideas of how these will work, but I know you’re a creative bunch and reckon you’ll probably blow my ideas out of the water! Go on, I dare you to show off your amazing ideas. Also, I’d love to hear any ideas you have for more cards. I’m always working on these and will keep adding more designs to the shoutoutcards.co website, so let me know what you’d love to see. Leave a comment below or check out shoutoutcards.co and contact me directly.